The intoxicating lure of Chaos leads untold millions down the path of corruption, and the noblest of intentions offers little protection against its dark influence. A soldier’s bloodlust, a politician's ambition, a lover’s desire, and even a mother’s whispered prayer over her feverish child – they are all the playthings of the Dark Gods. Why resist? Wealth, power, and happiness await those who serve the Ruinous Powers, and the only price is your humanity. Black Crusade is a remarkable standalone RPG that offers players an entirely new perspective on the conflict between the Imperium of Man and the forces of Chaos. This groundbreaking concept delivers the unprecedented opportunity to play as a Disciple of the Dark Gods, whether as a Chaos Space Marine or a human Servant of Chaos. Swear allegiance to your dark masters, and reap the rewards of their favor! 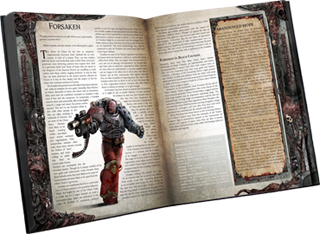 The Black Crusade core rulebook contains everything you need to start your adventure in the Warhammer 40,000 universe. Well, if you haven’t played any of the Warhammer 40k RPG lines, probably this isn’t the right place to start, since character creation is a bit more complicated and more open than Dark Heresy or Deathwatch (which should probably be your points of entrance into WH40k roleplaying anyway – depending on the style of play you’re looking for). Additionally, GMing for a mixed group of characters (normal heretics and chaos marines) can be a daunting task for a novice GM. Further on this (undeservingly small) review, I will assume that you are familiar with the game line, the systems and the other three games. Actually, the only real question about the game that i will try to answer is the following: if my group is enjoying one of the other three 40k game lines, would it be worth it to give Black Crusade a try for a short campaign? Well, rules wise, BC is the 4th revision of the 40k rpg system (in case you are only playing one game line, each of those actually has subtle – or in the case of Deathwatch – less subtle differences), and in my opinion these changes are good ones. A reasonably better psionic system than DH, the Infamy systems more clear cut than the Rogue Trader Wealth Mechanic and the slight combat changes make things quite exciting (reader discretion: I really don’t like Deathwatch and the absurd power level of the characters/encounters – if you like that style of play, not sure weather BC will satisfy you without future supplements), etc. Finally, although Dark Heresy had a strong Call of Cthulhu feeling at start (with the sanity rules, the big bad daemons, etc) I can’t really say it kept constant once the characters grew more powerful and swapped the stub guns for melta guns. In Black Crusade, things are different. Your slide into corruption is inexorable and inevitable, and the mechanics seem to mesh very nicely with the concept. 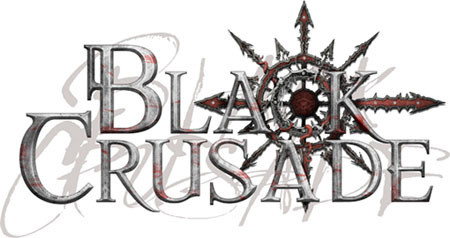 Overall (and quite subjectively – since RPG games are a rather personal experience), Black Crusade has been a must buy for me and my group since it was announced. The only bad thing I can find is the difference in the release date between the book and the collector’s edition, since essentially I ended up buying both versions :/ and the relative lack of material since it is one book vs a dozen+ in the other game lines. But it’s solid fun and great entertainment. I can’t really ask much more from an RPG game anymore. As stated this is a review of the game book and not the game. I have played and own many fantasy flight board games and love their quality so i expected nothing less when i bought the core black crusades book. I bought this book made my character put it on my shelf then took it to the game with me the next week. Upon opening the book mid way though the game session to look something up i find that all the binding (glue) had let loose so only the strings are holding it together. Being that i am new to the Warhammer 40k role-playing system I made a comment about it to my gaming group and was surprised when they all said this was common place for all the books. Just be aware that you might very well run into this problem as well. If i would have know i think i would have just went for the pdf. Btw the game itself i love however that part of the review i will leave to someone that will do better than me. Add a Review for "Black Crusade"